Even walking and hiking activities these days have not failed to be touched by technological advancements with more walkers turning to GPS devices to navigate from point A to point B. And, whilst there can be no denying the benefits of GPS, walkers should view these kinds of developments as an additional tool and not a replacement for the many other traditional methods of navigating when out walking. Having a good Ordnance Survey map and knowing how to read one is still crucial if you’re going out hiking. It’s important to be able to recognise the meaning of the scale of the map in terms of how that translates into distance and estimated time to cover a particular trail from point A to point B when out walking. In order to do that accurately, you’re also going to need a compass and know how to use it. You’ll need to understand what the longitudinal and latitudinal lines on the map mean as well as contour lines as the latter will determine the altitude at which you’re walking or intending to walk which will also have a bearing upon the length of time it will take you to cover a specific distance. Also get to know what each of the Ordnance Survey symbols mean as they can come in very useful. GPS hand-held devices have become extremely popular amongst the hiking community. By using a network of satellites that orbit the earth, the system is able to triangulate your exact position on earth within a few hundred meters and sometimes even more accurately than that using satellite maps and images. There is no doubt that maps, a compass and a GPS device offers you, by far, the best opportunity to navigate safely when you are out hiking. 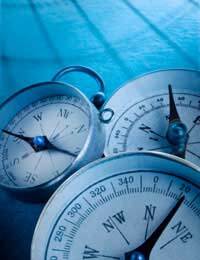 However, it’s often very useful to also learn some other more natural methods of navigation. These will not only help you confirm what your map, compass or GPS device is telling you but to be able to use the environment and the sky above you to assist you in your navigation might also come in useful if you were to find yourself in a survival situation without a map, compass or GPS device. Those who enjoy power walking will often prefer to rely on GPS as power walking relies on speed and, therefore, it is easier and quicker to refer to a hand-held GPS device than to have to stop to get out a map and compass. At its most basic level, understanding how the sun moves is key to being able to navigate. You should know that the sun always rises in the east and sets in the west. Therefore, by viewing the sun at sunrise or sunset you can then determine what are north, south, east and west by what the sun is doing at the beginning or end of the day. And if you have a watch, then at noon, the sun will be directly south. In the Northern Hemisphere, we have the North (or Pole) Star. If you familiarise yourself with that – it’s the clear star at the end of the ‘Big Dipper’ – then you know where north lies. Alternatively, below the equator in the Southern Hemisphere, the night sky is entirely different to what we see here in the UK so, in Australia, for example (or anywhere beneath the equator), look out for the Southern Cross as that will tell you where south lies. Of course, the only true way you can know your altitude is either through reading the contours of your map and being able to pinpoint your exact location against the map and using the contour reading to give you your altitude or by using an altimeter. However, nature has its own way of giving you some kind of indication as to whether you’re ascending or descending if you’re unsure. For example, on a mountain, leaf bearing trees will be lower down, then pine trees will be higher, then higher still the vegetation is likely to consist of bushes and moss then climbing even higher to see bare rocks and then, ultimately, snow. By keeping all that in mind, you can often survey a landscape with the naked eye to determine in which direction you want to be walking depending on whether you’re looking to ascend or descend. It is, however, important to realise that without maps, satellite maps, compasses and GPS, being solely reliant on nature and the environment is only going to give you a rough estimate when it comes to navigation. The more ways you do learn how to navigate, however, the more prepared you’ll be when out hiking in the event of any situation arising. Whatever else you carry, always have the right OS map and a compass with you. If your GPS fails, or the sky is cloudy, whatever other factors, you’ll still be able to find your way. Those two are the basic tools for any hiker to carry. All the rest, as they say, is gravy. All good advice. People can become over reliant on GPS systems, which can leave them in a pickle if the unit malfunctions (as they sometimes do). You really need to be able to read a map, at least the basics, and carry an OS map of the area where you're walking. It can save you ending up lost and hungry and walking far more miles than you'd planned. Check your section U"sing the Night sky to Navigate"The North Star aka Polaris is not in the Big Dipper. It actually is the last star in the handle of the Little Dipper.